Finally, horns from a modern perspective. No longer do you have to rely on orchestral brass for your horn needs. 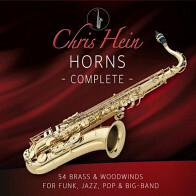 Until now, jazz or rock-oriented horn libraries have been almost non-existent. The void has been filled! Pop, latin, jazz, big band, and rock n' roll horns are all here, with unprecedented sound quality and programming. You get trumpets (played open as well as with various mutes), soprano, alto, tenor and baritone saxes, trombones (including mutes), flugelhorn and French horn. Instruments are presented in both solo and section contexts with chromatic samples, plus we've thrown in a ton of riffs, combinations and improvisations. This must-have VI library will be your first call for modern horns, and is one more reason Big Fish Audio's Virtual Instrument Division is filling the real needs of musicians the world over. 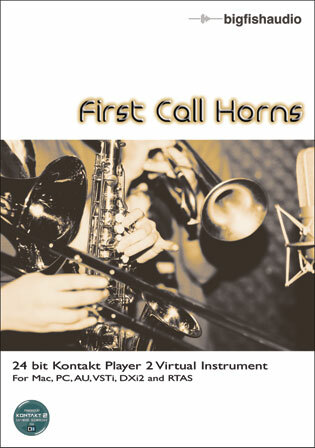 First Call Horns is powered by the Native Instruments Kontakt Player 5 engine, which is included on the disc. This provides instant integration with all major sequencers such as Pro Tools, Digital Performer, Logic, Cubase, and others. *Patch listing may vary slightly between Kontakt Player and Giga version. First Call Horns includes the Native Instruments Kontakt Player 5 engine. This allows instant access to the library directly from a plug-in interface without the need for any other sampler. The Kontakt Player 5 engine supports standalone operation as well as AU, VST, RTAS, and DXi plug-ins. Instruments from this library can also be opened in the full version of Kontakt 5, which allows for deeper editing and tweaking. Special upgrade pricing to the full version of Kontakt 5 is available to registered users; see the Native Instruments crossgrade page for details. The Following End User License Agreement is included with First Call Horns. This License is only valid for the individual who has purchased an unopened, new and lawfully made copy of First Call Horns from a dealer or distributor authorized by Big Fish Audio. Electronic Musician | I highly recommend the set.